The physical school environment encompasses the school building and all its contents including physical structures, infrastructure, furniture, and the use and presence of chemicals and biological agents; the site on which a school is located; and the surrounding environment including the air, water, and materials with which children may come into contact, as well as nearby land uses, roadways and other hazards. If children are the seeds of our future then schools are the garden in which the aspects of a healthy environment are the micronutrients plants need to reach their full potential. Take crucial nutrients out of soil and the land becomes fallow. In the same way that fertile fields enable healthy plants to take root and reach for the sun, a healthy learning environment can empower individuals to seek out their path to enlightenment. The physical school environment strongly affects adolescent health in myriad ways, including contaminated water supplies causing diarrhea, air pollution worsening acute respiratory infections or triggering asthma attacks and exposure to chemicals, solvents, and pesticides. Furthermore, children, relative to their body weight, breathe more air, consume more food and drink more water than adults. Exposure to contaminants in the air, water or food will consequently be higher than adults. Reduced immunity, immaturity of organs and functions and rapid growth and development can make children more vulnerable to toxic environments. Compounding these risks are behavioral patterns such as lack of hygiene and the lack of experience in risk assessment. The condition of a school’s physical environment can impact the health of both students and staff. It has been demonstrated that all members of the school community need clean air to breathe, clean water to drink, a safe place for recreation, a safe way to travel to school to avoid accidents, and protection from extreme temperatures and ultraviolet radiation. A safe and healthy physical environment requires a good location and safe buildings; protection from excessive noise; natural light; clean indoor air and water; a healthy outdoor environment; and healthy school-related activities including safe management and maintenance practices, use of non-toxic cleaning supplies, careful use of pesticides, vector control, and use of non-toxic art supplies. To learn, children and adolescents need to feel safe and supported. Without these conditions, the mind reverts to a focus on survival. Educators in high-performing, high-poverty (HP/HP) schools have long recognized the critical importance of providing a healthy, safe, and supportive classroom and school environment. This means all forms of safety and security while at school—food if hungry, clean clothes if needed, medical attention when necessary, counseling and other family services as required, and most of all caring adults who create an atmosphere of sincere support for the students' well-being and academic success. When students who live in poverty experience comprehensive support that works to mitigate the limiting, sometimes destructive poverty-related forces in their lives, the likelihood for success is greatly enhanced. Many HP/HP schools engage parents, families, and other community members by opening their doors and expanding their schedules to offer clubs, parent support and education, early childhood activities, GED programs, advisory groups, community education classes, and a host of other events and activities of interest to the community. These HP/HP schools partner with community or city organizations, local foundations, state and municipal agencies, service clubs, universities, and businesses to host these valued endeavors in their buildings, as well as offer services at times that better fit families' work schedules. When the collective community actors are on the same wavelength then anything is possible when it comes to effecting the change they want to see. 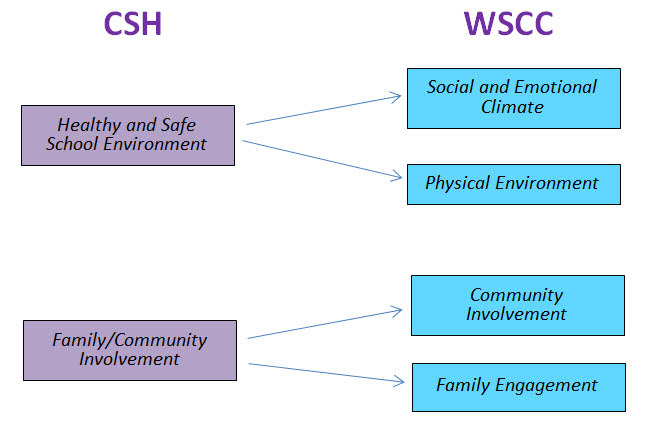 In the following blog posts we'll delve deeper into other tenets of CSHP and the Whole Child framework now that we have covered the importance of the physical environment on learning. We don't need to tell seeds how to grow but we do need to provide them the right foundation and nutrients to reach their potential. Every step we take in the right direction is a small victory to that end. Ottawa Charter for Health Promotion. First International Conference on Health Promotion, Ottawa, 21 November 1986. http://www.who.int/healthpromotion/conferences/previous/ottawa/en/ (This reference has provided the general approach on which this document is based and is applied to all sections of this document without specifically being referenced.). WHO. Healthy Nutrition: an Essential Element of a Health-Promoting School. WHO Information Series on School Health. Geneva: WHO, 1998. (This document has been used as a model in developing this report and is qutoed without specifically being referenced. Other documents in this series were also referred to in the development of this report without specifically being referenced).